In a world obsessed with size, tankers and containerships often steal the limelight in the shipping industry. But there is another important sector that makes up the ‘big three’ in the shipping world: dry bulk carriers. Often referred to as the workhorses of the maritime business, these ships are designed specifically to carry dry cargoes such as grain, iron ore and coal, in bulk. Recognisable by the large box-like hatches on deck, which slide out for loading, bulk carriers vary enormously in size. From tiny single-hold coasters with a 500 ton load, to huge Capesize carriers of up to 230,000 tons, which might take on the task of transporting cargoes of iron ore or coal from Australian mines to Chinese steel mills. Known for their efficiency and cost effectiveness, some 6,000 bulk carriers, or bulkers as they are sometimes referred to, trade around the world. 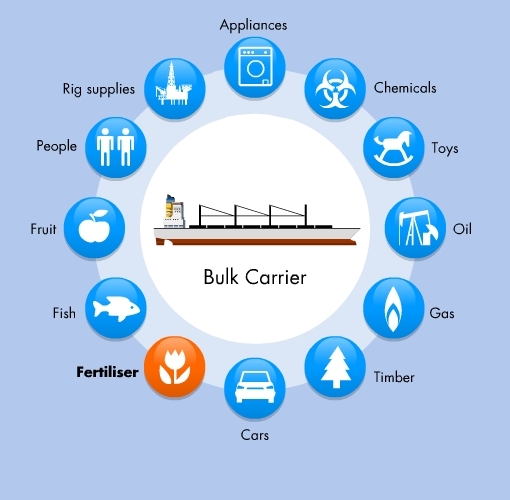 Some of the more sophisticated bulk carriers have their own cargo handling equipment on board, in the form of derricks, cranes or conveyor systems, while other make use of specialist port equipment to blow, grab, pump or convey the cargo away from the ship and into customised storage buildings.